The Sojourn River is a freshwater tributary of the Elmswell River in the Outerlands. Created several thousand years ago, a small pond was formed from a spring fed by an offshoot of the Planetary Veins. The relatively flat topography of the area did not allow the water to settle in one area, and the excess began to slowly carve its way southwest until it reached the infant Irenic Ocean. 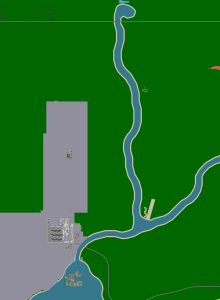 The Elmswell River formed in a similar manner, and they join near the mining colony of Zlata Ves. Their juncture forms a silty current for which the original inhabitants of the Zelen� Islands found suitable for agriculture, and began a life isolated from civilization within the delta of the Elmswell. The Sojourn -- and the Elmswell -- provides a lucrative fishing industry for the few residents that choose to live in the Outerlands. The powerful flow of the freshwater river downstream allows for healthy, fresh water well into the delta of the Elmswell. In regard to the fishing industry, the Elmswell Bluefish? and the Sojourn Herring? are desired fish of the river, only venturing out for a short time in the fall to spawn.